When you wake up thirty-two minutes late and you hair looks like you washed it three Thursdays ago, you have neither the time nor the patience to watch oatmeal overflow in the microwave. So you whip out your blender and you put your oatmeal in a smoothie. Bada bing bada boom! I’ve never had a really nice blender, so you can imagine my sheer joy when this beyond beauteous touchscreen Blendtec Designer 725 showed up on my doorstep like a little gift from the smoothie gods. Step aside smart phones. Smart blenders are all the rage. They even tell you to be healthy! I never realized how amazing it is to have a bigger blender. Mine has always been single serving, which is fine sometimes and not so fine when I have to puree a bazillion cups of piping hot soup. I imagine that sometime in the next ten or so years, I’ll be smoothie-ing for a hunky hubby and perhaps some little tots. This vision would most definitely require a larger blender. 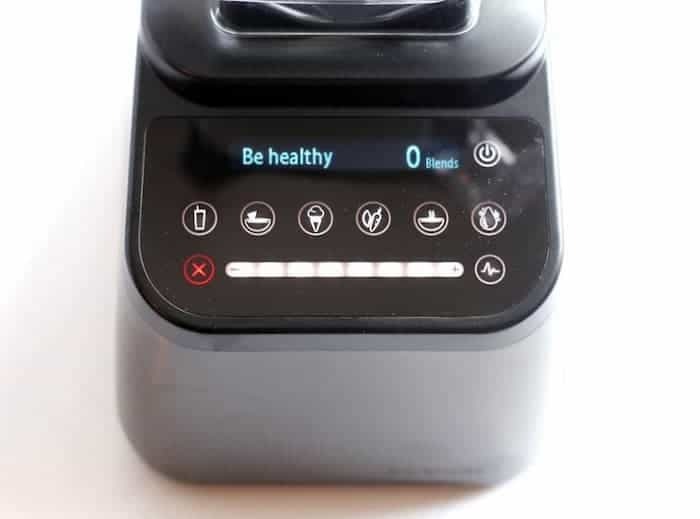 There are six preprogrammed custom cycles for one-touch blending, including smoothie, salsa, ice cream, whole juice, hot soup, and clean. So basically you just touch a button and it does all the work for you. Pretty neat, huh? The clean button is not as fun as the others, but hey…whizzing up soap and water makes clean-up a breeze! I think making a whole foods juice in this bad boy would be pretty amazing. For smaller batches, the blender also comes with a smaller wildside jar. I’ve been using that one for single-serving smoothies in the morning. What I really, really appreciate about my new kitchen bestie is that I can walk away and tame my hair knowing that when I come back, my smoothie/soup/enchilada filling will be all nicely blended up and ready to go. And I’m not gonna lie, the beautiful touch screen interface makes me feel kind of like a celebrity blending an epically nutritious smoothie. It’s just so…pretty! Fancy pants. 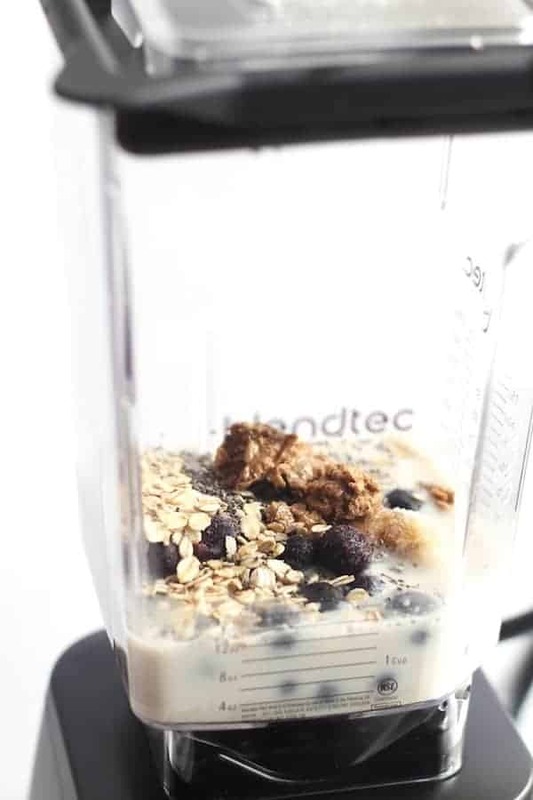 You know what else is splendid about the Blendtec? It has this super thick but uniquely blunt blade that blends the bejeezus out of fruits and veggies but won’t cut up your hands when you’re cleaning it. Can I get a hallelujah?! Let’s chat a bit about this smoothie. Oats are a fabulous source of soluble fiber, which helps lower that “bad” LDL cholesterol and reduce your risk of heart disease. Blueberries are basically the love of my life, not to mention the fact that they’re rich in a polyphenol called resveratrol, which studies suggest helps delay cognitive decline and improve memory. Almond butter gives it a silky smooth texture with the added benefit of those heart-healthy fats. Add some banana for sweetness and you’re ready to blend! I often add a handful of spinach and a skoop of Healthy Skoop protein powder for extra staying power. If breakfast were a person, it would totally be best friends with this smoothie. 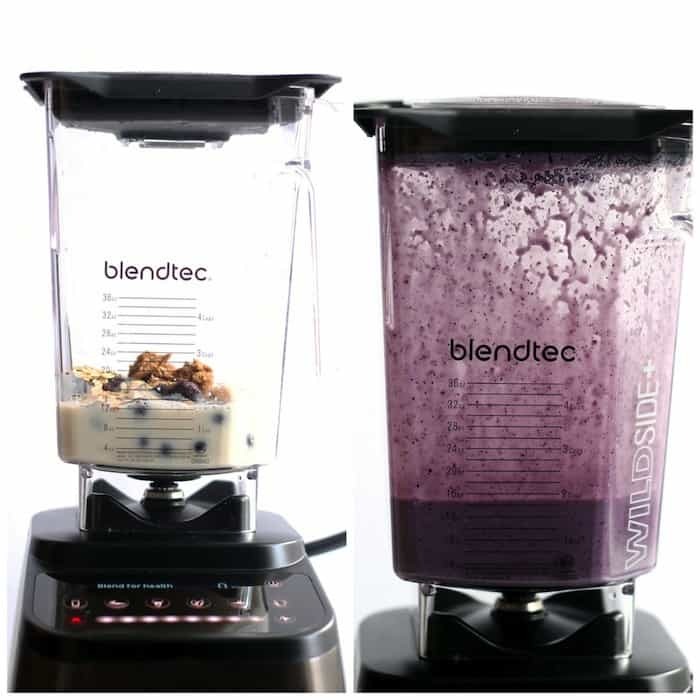 For more Blendtec fun, you can follow them on Facebook, Instagram, Twitter, YouTube, and Pinterest. This post is sponsored by FitFluential LLC on behalf of Blendtec. Thanks for supporting to brands that support Hummusapien! When oatmeal overflows in the microwave I just give up on life. JK but really though!! 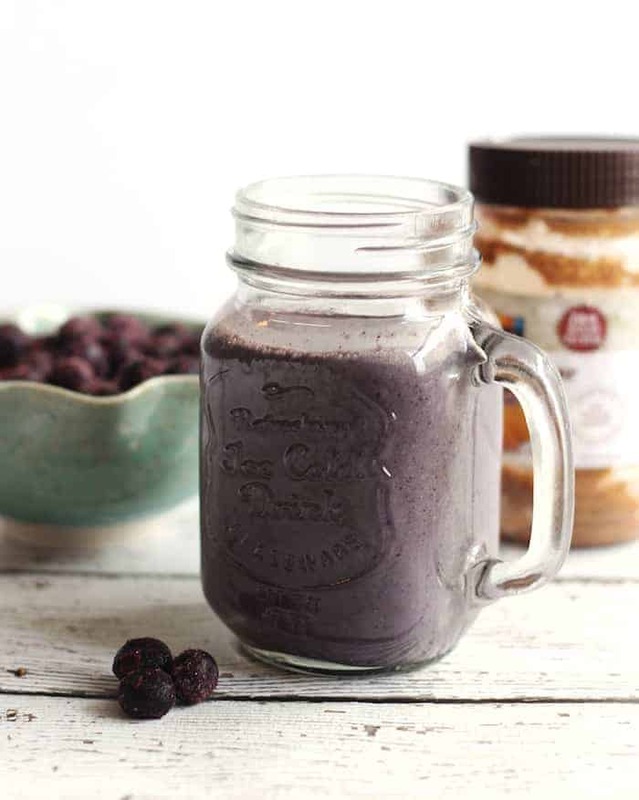 This looks like a good one:) I am all over blueberry smoothies and blueberry bowls lately . . . Thanks for sharing!! I’ve gotten to a point where I don’t even want a smoothie unless it involves blueberries…oopsies! 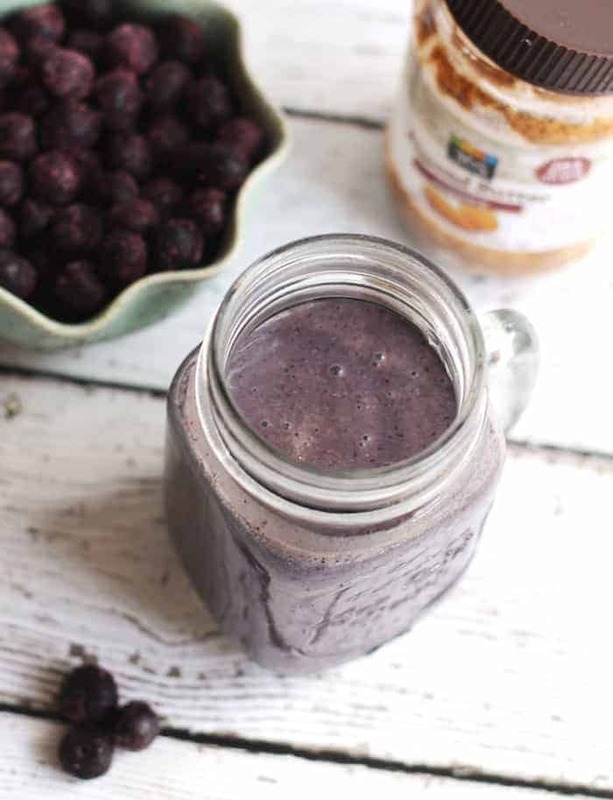 Oohbhhhh I can’t wait to try, a little change up from the blueberry cacao smoothie I am totally in love with. Now I have two breakfast besties! Along with overnight steel cut oats with mixed berries and justins maple almond butter that I had for brekkie this AM. Wahoooo I loooove breakfast and I will be whipping this up tomorrow! I made this this morning…..OBSESSED. I have never put oats in my smoothie but I will be from now on. Thanks so much for the awesome recipe! Awesome! I’m so excited that you tried it and loved it! YEEEEES! Welcome to Blendtec heaven, I love mine! I’ll be making all the smoothies when I’m all the late (for…something other than work, since I don’t have a job). Such a tasty smoothie recipe, mmmhmmm hell yamaha! :D Hope you’ve had a lovely weekend! Bahaha you have the best job evaaaa!! The tastiest one ever, for sure. I’m so jealous of your Blendtec. I would cry if I ever got one. And this smoothie looks divine. Frozen blueberries are like candy! Love smoothies for breakfast. I prep everything in the night (thaw berries, banana and cut kale etc.) and then it takes me just 5 mins to whip it up! Will definitely try out your recipe! YUM!!!! Just made this for breakfast and loved it!! Didn’t have almond milk so I just threw in 1/3 c raw cashews, 1 c water and a dash of vanilla – worked great in my Vitamix!! Perfect! I’m thrilled you enjoyed it, Darla! This is the best smoothie I’ve ever made! Not only delicious, but balanced and super filling. Wow! I’m so excited to hear that, Jamie! Isn’t it awesome when smoothies are tasty AND fill you up?! I’m Sam Clark’s sister, by the way! :) She turned me on to your blog a week ago and I’ve already made 5 recipes! Mmmm what a great idea to add dried plums! I made a double batch of this to make breakfast even quicker, added a little cinnamon and honey, and wow–it is amazing! I’m definitely adding it to my weekly rotation. calories: saturated, unsaturated fats, sodium, protein? Blended this recipe for the first time today and am drinking it now. This recipe is a KNOCK OUT!! Amazingly delicious. I’ve been on a smoothie craze and this has been an absolute gem to find. I’m fairly new to blending spinach into smoothies (I like them in my salad and learning to like it in my smoothie) and this recipe lets me get my greens without tasting it. LOVE LOVE LOVE this recipe. Thank you for sharing! !